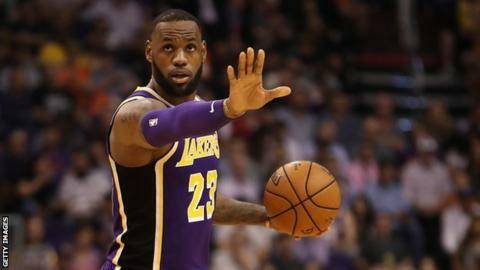 LeBron James claimed his first NBA win for the Los Angeles Lakers with a 131-113 victory over the Phoenix Suns. The three-time NBA champion put up 19 points, 10 assists and seven rebounds before sitting out the fourth quarter, with the Lakers 20 points ahead. It follows three straight defeats for the Lakers to start the season after James, 33, joined from the Cleveland Cavaliers in the summer. Lance Stephenson led the Lakers with 23 points off the bench in Phoenix. The visitors were without Rajon Rondo and Brandon Ingram, who are serving bans for their part in a brawl during defeat by the Houston Rockets on Sunday. Devin Booker hit 23 points for the Suns before exiting in the third quarter with a sore hamstring, while 2018’s number one overall draft pick Deandre Ayton had 22. Elsewhere, Stephen Curry scored 51 points in three quarters, including 11 three-pointers, as defending champions the Golden State Warriors beat the Washington Wizards 144-122. The two-time MVP, 30, finished three points short of his career high of 54 and three three-pointers short of breaking his NBA record of 13 made in a single game as he did not enter for the fourth quarter. His 51 points is the most by an NBA player this season, surpassing Detroit Pistons power forward Blake Griffin’s 50 in their victory over the Philadelphia 76ers on Tuesday, while Curry also moved above Suns guard Jamal Crawford into fifth on the league’s all-time three-pointers made list, with 2,162. The Rockets, who lost to the Warriors in last year’s Western Conference finals, fell to their third defeat in four games as they were beaten 100-89 at home by the Utah Jazz.